If you are unfamiliar with who Florida artist Plap Fieldz is or never heard his music, what rock have you been living under? Plap Fieldz is one of the dopest rappers coming out of the Gunshine State. Plap first jumped into the music scene in 2016, at the time when the "So Gone Challenge" was trending on social media. The challenge involved someone freestyling over famous Atlanta singer Monica's "So Gone Instrumental". After doing the challenge and posting the video on Facebook, it quickly went viral and people wanted to hear more from Plap Fieldz. Plap's Facebook and Instagram account both started getting thousands of followers from people all around the country, so he decided to finally try his hand in the rap game. In the beginning, a few people doubted he could consistently drop hits, and be taken serious as a rap artist because Plap Fieldz at the time was not a rapper and he did not have any recorded music out, or any other musical content. But what people didnt know was Plap had a vision, talent, determination, and a story to tell. 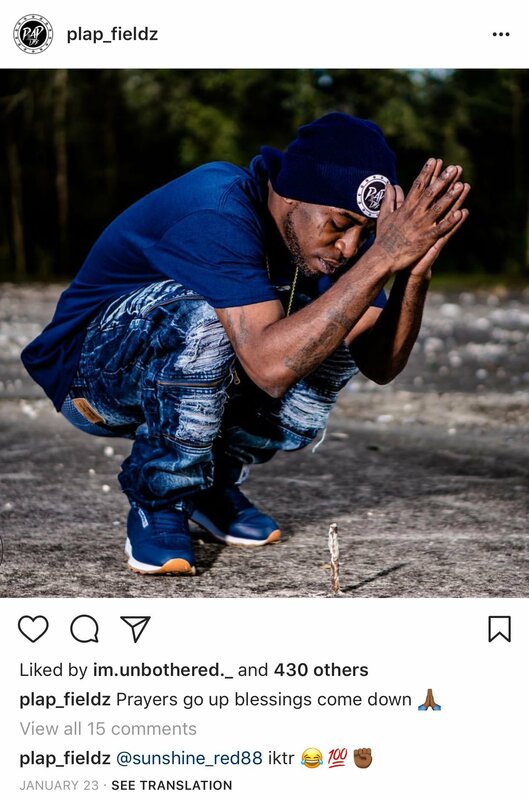 "Respect will take you far in this world"
So Plap found a studio in his area, and started working on his first mixtape, but he also continued uploading his freestyle videos. He now has dropped hits like"Boosie Juice, Another Ghetto Story, Regulators, Take Off, When The Ex Calls", and many more & he has now put up over 12 million views easy on social media, independently. People all over the united sates are starting to catch wind of Plap Fieldz and the whole Plap Life Movement. And his fans have been wanting to know more about the man behind the music. Now in an exclusive interview for PlapLife.Com Plap Fieldz answered alot of unanswered questions for his fans and supporters. such questions like "where did the name Plap come from", "where did he grow up", and "What does respect mean to him", just to name a few. " Respect will take you far in this world " Plap says during the interview. " Not being gangsta, not being hard, or thinking you got all the sense, its respect" plap said to the interviewer Leteta S Horne. You can check out the exclusive interview here on our website, or you can also stream it on YouTube.